I know you’re in shock at seeing a picture of a dessert on here. I almost never make them because I just don’t have much of a sweet tooth and I’d almost always rather make myself sick with leftover main course than have a dessert. But Matthew loves tiramisu and when I mentioned being intrigued by the recipe in Urban Vegan, he started foaming at the mouth and blabbering about Vin Santo, so I knew I’d have to try it. 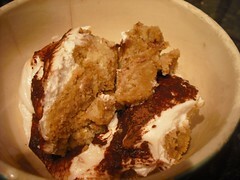 I promised that one night over the holidays I’d have an Italian night with either pizza or pasta, and tiramisu. The first hurdle was finding the right type of soya cream. The author insists on a certain brand, which I could probably have got mail order, but I had a carton of this hanging round as a result of a shopping list misunderstanding, and decided to see if it would work. The dish wasn’t as hard to make as I expected, especially if you’re more experienced at baking than I am. It was just a matter of making a sponge base, dipping it in coffee, then making the topping, combining it all and letting it sit in the fridge. I was still a bit suspicious – how could something that depends so heavily on dairy products be worth eating? Wow. This was great. So light and fluffy but rich, creamy and decadent. I’ve seen several people on Post Punk Kitchen saying that this dish was worth the price of the book alone. I’m not sure I agree with that because I’ve made plenty from this book and with only one exception loved all of them. The saltimbocca was worth the price of the book for me. But I certainly agree that this was an amazing take on something I never imagined myself eating a vegan version of, and I can only imagine how much you’d love it if you’ve got a sweet tooth! 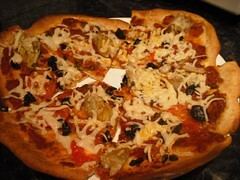 This entry was posted in Urban Vegan by efcliz. Bookmark the permalink. Your continued glowing endorsement of this cookbook has made me purchase it. 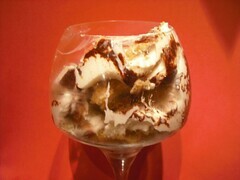 I love Tiramisu and now I can’t wait to try this recipe! I think I might soon buy the book because of your great reviews. Soja Saane has exactly the same ingredients as soyatoo and tastes exactly like it. If you ever need another box of that stuff I’d love to send you some.